Elkhart « Midlife Crisis Crossover! 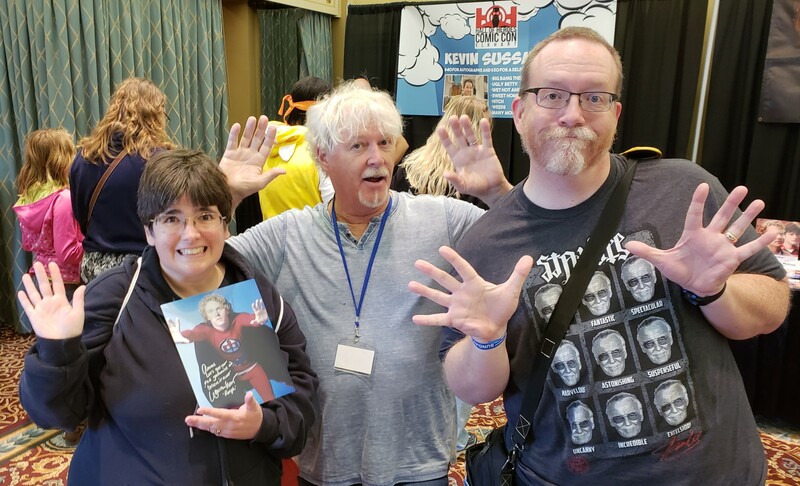 It’s William Katt! The Greatest American Hero! Believe it or not! …and it very nearly didn’t happen for us. Our original plan called for driving three hours from Indianapolis to Elkhart on Saturday, enjoying HoHCC, and returning home the same evening; then on Sunday driving 70-odd minutes west of Indy out to Turkey Run State Park for Anne’s annual family reunion. We would’ve been wasted come Monday if Plan A had happened. All lights were green through early Friday evening. Then a couple of things spun out of our control. Hall of Heroes Comic Con 2018 Photos, Part 1 of 2: Cosplay Dance Party! 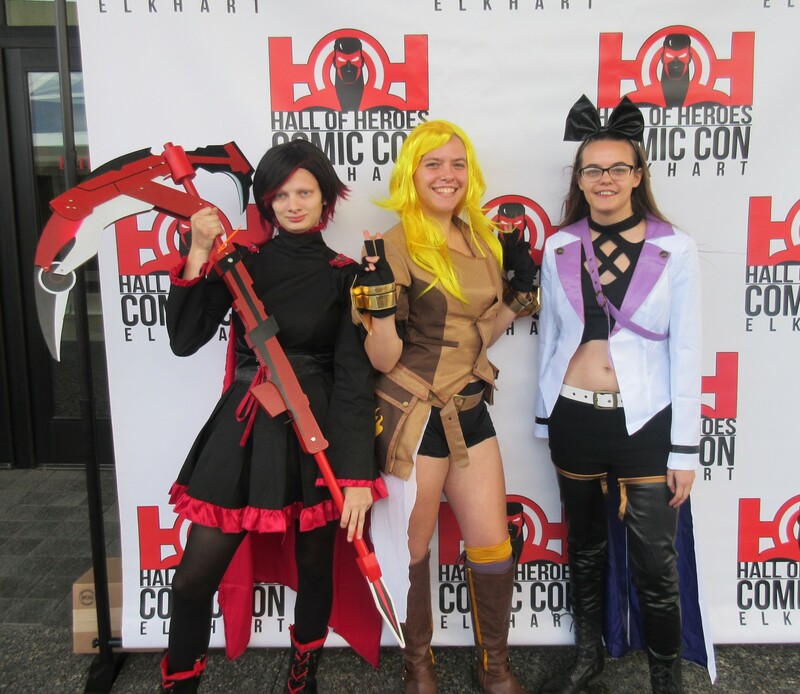 Guarding the front door were Ruby Rose, Yang Xiao Long, and Blake Belladonna from RWBY. Previously on Midlife Crisis Crossover: in March 2017 my wife Anne and I attended the inaugural Hall of Heroes Comic Con in Elkhart, Indiana. Under the same ownership as the nearby Hall of Heroes Museum (which we’d visited the year before), HoHCC was a two-day convention contained entirely in Elkhart’s historic Lerner Theatre, a beautiful 94-year-old venue for live plays and other cultural events. The organizers made creative use of the available spaces and had the assistance of a bevy of friendly volunteers. Initial response from fans statewide and beyond was so overwhelming, they earned themselves an encore presentation, this year in a much warmer September as opposed to that wintry March. 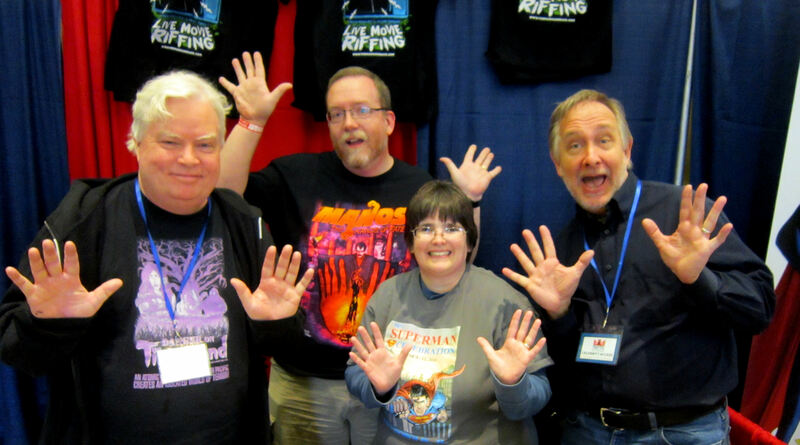 Say hi to the roadshow cast from Manos: The Jazz Hands of Fate. 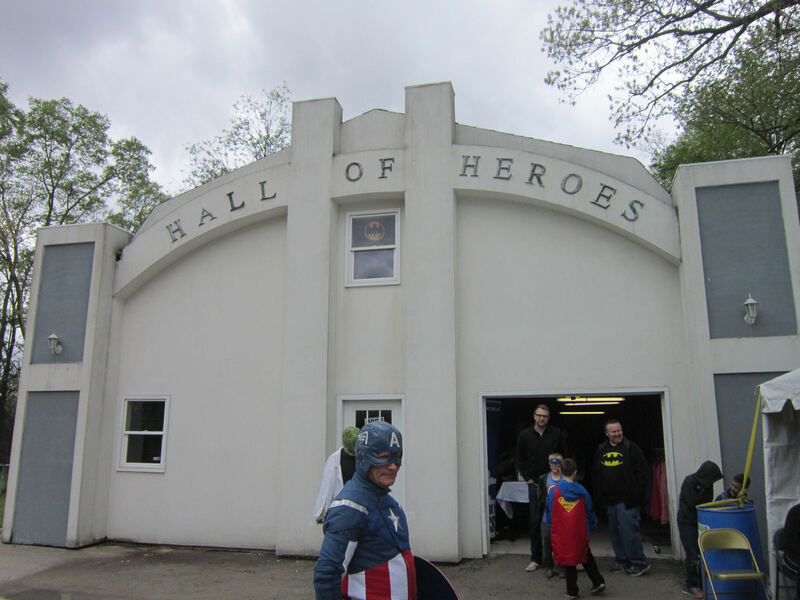 Previously on Midlife Crisis Crossover: last May my wife and I traveled three hours north to the town of Elkhart to visit the Hall of Heroes Museum, an impressive collection of toys, comics, merchandise, and movie memorabilia. We also walked along their Main Street downtown, enjoyed ourselves despite the unseasonably bitter temperatures, and expressed hopes of returning one day. Today was that day. This weekend museum owner Allen Stewart oversaw the first annual Hall of Heroes Comic Con, a natural extension of his longtime hobbies and all our favorite comic cons where we’ve encountered his company’s booth on multiple occasions. Thanks to the event explosion we’ve been enjoying in or near Indianapolis over the past four years, we’ve had chances to attend more shows and meet more creators and actors than in all our previous forty Hoosier years combined. We can’t attend every show ever, but we’ll make the time and the drive if something or someone nails our interests. For me, Stewart and his team did exactly that. Pictured above at left is Frank Conniff, a.k.a. TV’s Frank from Mystery Science Theater 3000, one of my all-time favorite TV series. At right is Trace Beaulieu, better known as TV’s Frank’s nefarious boss Dr. Clayton Forrester, and the original voice of Crow T. Robot. We previously met him at C2E2 2015, but this is a far better photo, and not just because it has TV’s Frank in it. Beyond meeting Joel Hodgson at Indy Pop Con 2014 and Mike, Kevin, Bill, and Mary Jo in St. Louis in 2000, the esteemed Mr. Conniff was the only major cast member I hadn’t met yet. For that alone, for giving me the unexpected opportunity to complete the autograph set on my copy of The MST3K Amazing Colossal Episode Guide, I deem this a fantastic weekend, 12/10 hope to visit yet again someday. You Can’t Spell “Elkhart” Without “Art”. Or “Hart”. Or “Elk”. My wife and I have a twice-yearly tradition of spending our respective birthdays together traveling to some new place or attraction as a one-day road trip — partly as an excuse to spend time together on those most wondrous days, partly to explore areas of Indiana we’ve never experienced before. My 2016 birthday destination of choice: the northern Indiana city of Elkhart, with a bonus stopover in South Bend, both some 100+ miles north of here. Elkhart was regrettably cut a little short because the weather was miserable and tried to freeze us in our tracks, but we had enough fun to fill out another four-part miniseries starring a candy factory tour, a super-hero roadside attraction, and a selection of the “art” in Elkhart. Also, food. 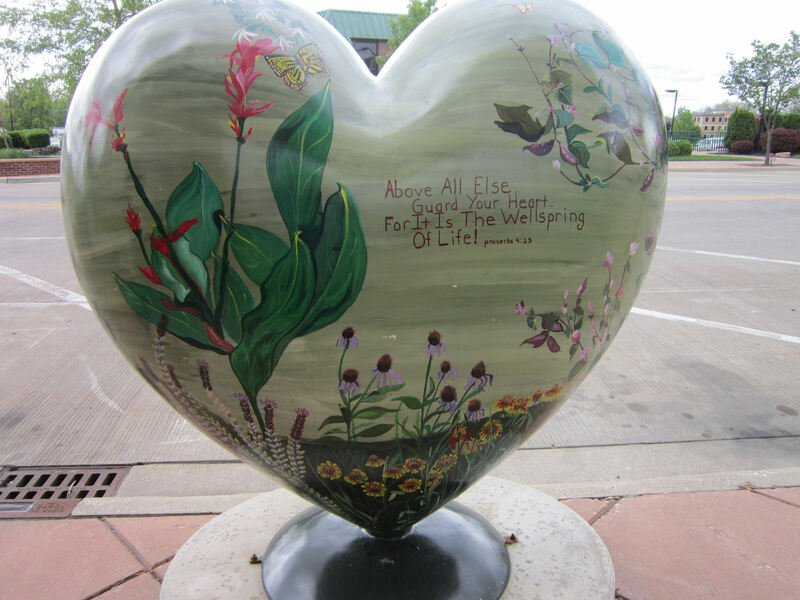 Part Three of Four: a tour of the art of downtown Elkhart, which of course has deer statues, because “elk”. And “hart”, which is a bit more obscure except maybe to fans of Angel. And the sound of “heart” alone likewise doesn’t go unmentioned. Gathered together from the cosmic reaches of the universe, here in this great Hall of Heroes, are the most powerful forces of good ever assembled: Captain America! Deadpool! Bucky! Cartoon Hulk! The Lizard! Part Two of Four: a birthday celebration for a venerated super-hero at a museum made by a fan for fans. Right this way for a glimpse inside the Hall of Heroes Museum!